When I became pregnant with my second baby, I knew I would do the baby shower thing a little differently this time around. I didn't really need any "things" because we already had everything from Genevieve. 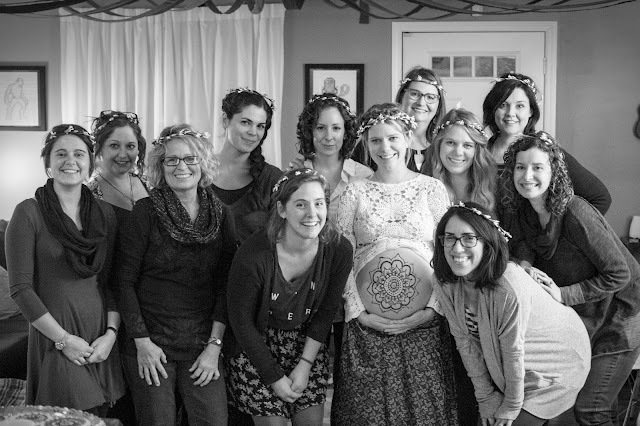 My baby shower with Genevieve was still really special because it was 40+ women, most of them my mom’s age, who shared advice and blessed me as one mother to another. My mom and mother-in-law were able to bless me as a soon to-be-mother. It was perfect and exactly what I needed for that season as a mother-to-be. I am now a mother and know what that means and I know what going through birth means as well. But with the craziness of my life, I haven’t been able to really spend the time to process my upcoming labor. I knew that a blessingway ceremony would be the perfect occasion to help me prepare for birth and meeting Adelaide. 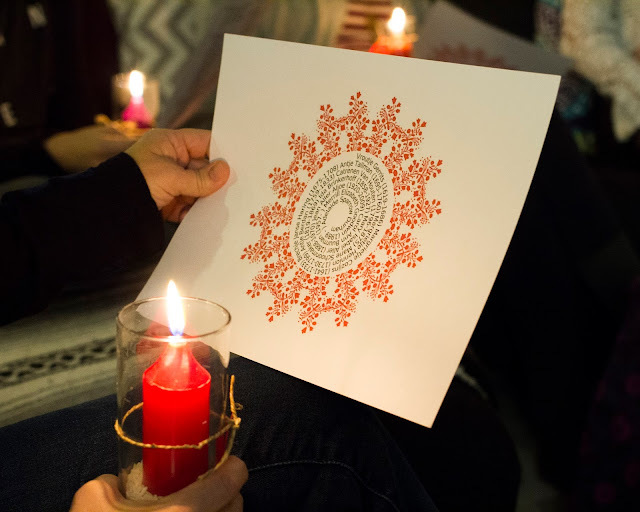 Also known as a Mother's Blessing, a blessingway is an opportunity to create a moment in time that celebrates and honors a pregnant woman and her journey into birth. This ritual is derived from a Navajo tradition that recognizes and honors the journey of pregnancy and the transition of birth as a momentous occasion in a woman’s life. It is a celebration of pregnancy and birth as a sacred and unique journey where the collective energy of loving women can help guide the mother through birth. Unlike most cultures, we don’t find many rituals in American culture these days. There’s rarely a coming of age or naming ceremony. 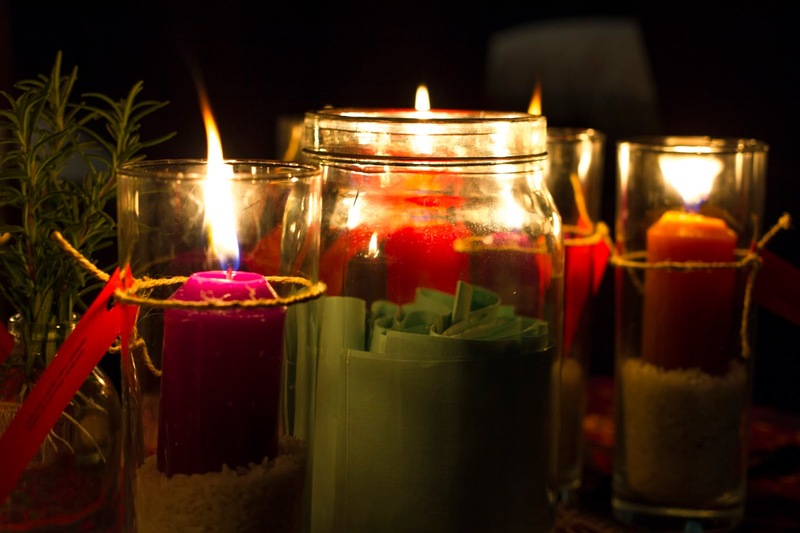 Weddings and funerals are the extent to rituals that we experience in our everyday lives. But there is power in ritual. 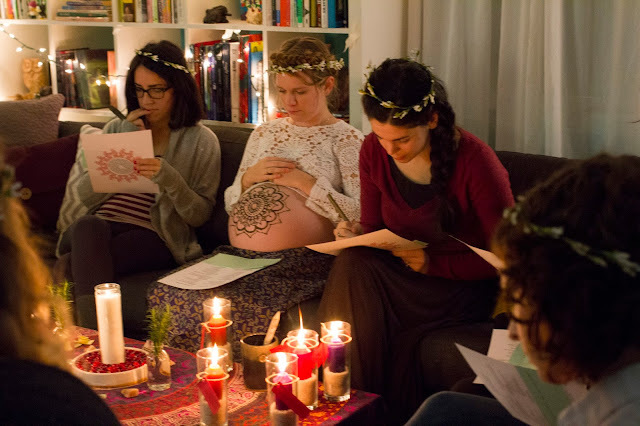 It marks transition, it affirms important values, and it provides an opportunity to connect with women in a sacred place free of distractions (like little children). When women connect we celebrate our femininity and that subtle acknowledgement of a tribe is profound. Rituals are doorways between the spiritual and physical world. We experience a moment in time and then step back into our daily lives enriched by that experience. Birth requires a spiritual intention. A pregnant woman feels unlike anyone else on earth. And perhaps only a woman--perhaps only a mother--can truly understand this. The knowledge that a new being is growing inside of you creates immense joy and happiness. When consumed in birth world, women face the thin veil between life and death. Their baby is very much alive but not yet born. While physically it is no small feat to birth a child, spiritually a woman is shifting from housing two souls to now creating an individual life who will walk this earth. The depth of that experience, and the need for preparation, deserves to be acknowledged and celebrated. So after hours of writing and researching, I wrote my own blessingway ceremony. I felt like I was creating my wedding program and it carried a similar weight for me. I hope you enjoy reading about this sacred event. I had everyone take off their shoes as a way to signify the sacredness of the event. They put their phones away so we could all be fully present in the ritual. 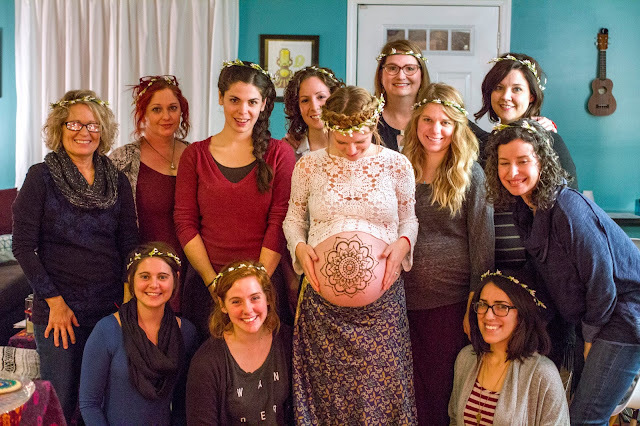 I made a flower crown for each woman as a way to show value to every woman in my tribe. Carissa drew a beautiful henna design on my rotund belly as a way to honor and nurture me and Adelaide. And we lit candles as a sign of reverence for this moment. I explained that tonight was a way to gather the women in my tribe and to release fears and shift my focus from pregnancy to preparing for birth. I was less than 2 weeks away from being full term and now I am focusing on Adelaide. This was not a religious ceremony but a very spiritual ritual. We had a spectrum of religious beliefs in the circle, so I asked that everyone would allow themselves to be present and participate and acknowledge the spiritual depth of birth that deserves celebrating. 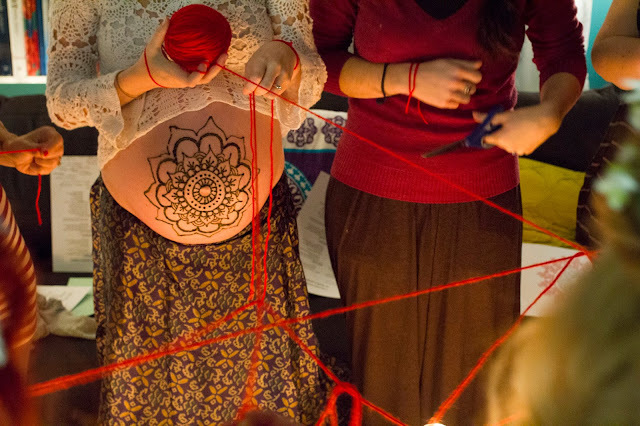 Because most women in the circle are birth workers or have given birth, the idea that pregnancy and childbirth is a spiritual event is one that is easily recognized. Today we gather in gratitude. We are grateful for the new life we are about to welcome into this world. We are grateful for the presence of Merrill in our lives. We also gather in preparation. We intend to prepare Merrill, giving her strength, support, and clarity in Mind, Body, and Soul for herself, for her birthing, and for her baby. She then lit her candle and each person in the circle then took turns lighting their own candles. They will take the candles home and light them when Adelaide starts her journey earth-side. Last year I took the time to create a family tree using ancestory.com. I was able to go back 12 generations on my maternal line. I felt it was important to include that because there is power in recognizing your heritage and the women that gave birth generations before you. When my grandmother, Jean Aljoe was pregnant with my mom, I was an egg inside of my mom. The direct maternal connection is worth acknowledging and I felt it was fitting for my sister to read this poem. Each birth traces down to you. Next, let us help Merrill release her fears surrounding birth. Giving birth is a releasing process. The process of letting go of fear is one of the most powerful parts of a blessing way. By Merrill releasing her fears, that space can be filled with openness and love. I am not afraid of having to transport in case I need some intervention (although I wouldn't want that, of course). I was more anxious about the idea of not being home right after delivery. That was my favorite part of having a home birth last time. It is easy to feel like I should have an easy pregnancy and delivery because I know so much about the process. And my birth team consists of some of my favorite people and coworkers, so releasing this fear in the presence of my birth team was so freeing. My midwife really released me when she said, "Merrill, you are a birth professional but you are not a professional birther, just let this birth happen." I had a challenging birth with Genevieve and I truly believe that it was a transformative and healing process for me. But sometimes I worry that all of a sudden my body will shut down in labor like it did with Genevieve. I do feel much more prepared for this now and have tools to respond if I have trouble again. Because of my intense labor with Genevieve, I had some shock after delivery. It took me a few weeks/months/years to build our strong attachment. I loved her from moment one but it has taken time to truly fall in love and connect with her. Thinking about this process with another child really overwhelms me and my prayer is that this process is a little smoother with Adelaide. Release your fears, expectations, and distractions. May you now be free to focus your mind and heart on the present moment. Trust in the process, your body and baby know what to do. This is Adelaide's birth story. As my sister pointed out, how amazing is it that the woman who will catch my baby is sitting in this circle? Not everyone can say that of their care provider... I have such an incredible birth team surrounding me and I was blessed beyond measure to have them there affirming me that night. from mother of one to mother of two. in all the ways you hope to be changed. guide you through what's coming. -You have enough, all that you need. You are enough, all that you need. Surrender to it and trust in it. -Surrender, breathe, open - keep breathing slowly and evenly. Inhale peace, exhale tension. -Surrender to the process of love, you and Michael made her in love. -Fear is cast out by love. Be confident in the love you have for Adelaide and the love you and Michael share. -Each contraction is one step closer to meeting Adelaide. You can birth your daughter. -Have faith and confidence in your body and your strength. Seek moments of joy and rest and peace in the season of anticipation. We then stood and created a visual representation for the tribe of women surrounding me and supporting me in this next season. This web of string symbolizes that we are united as one and represents the circle of women surrounding Merrill. We are committed to supporting her as she transitions into this next season of her life. We cut the red string and everyone tied the string to their wrist. 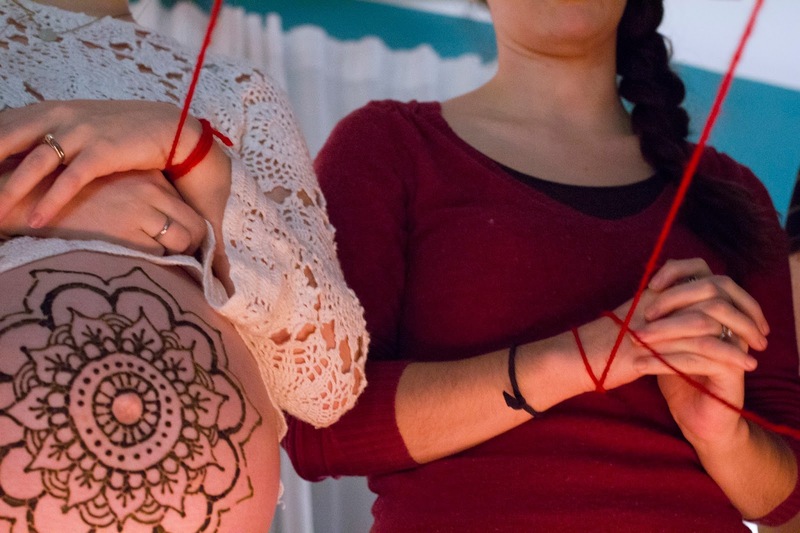 Traditionally, the string serves as a reminder to support me once the baby arrives and is removed once they visited me postpartum. who has come into our midst as a gift. as I nurture and learn from this child. Give me patience. Give me strength. "May the long time sun shine upon you. The ceremony ended with everyone blowing out their candles. Like with many rituals, a blessingway ends with food and fellowship. Carissa did such a beautiful job on the food! I love the cake and cookies! Thank you to each and every person who attended my Mother's Blessing (and to those who were there in spirit). You lifted me up and surrounded me in such a special way. I will carry that support with me as I welcome Adelaide to this world.